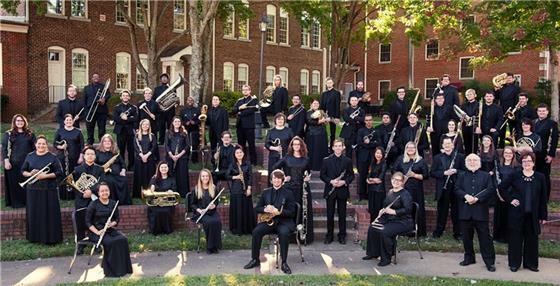 The Lee University Wind Ensemble will host its second concert of the 2017/18 season on Tuesday, Nov. 28, at 7:30 p.m. in the Conn Center. Under the batons of Conductor Dr. David Holsinger, professor of music, and Associate Conductor Winona Gray Holsinger, director of instrumental projects at Lee, the ensemble will present the music of Michael Markowski, a rising young American composer, along with works by ensemble favorite Vaclav Nelhybel, late 19th century Czech composer Julius Fucík, and the American march king John Philip Sousa. The concert will also present the first of two large-scale works planned for the year, Dr. Holsinger’s ballet suite for winds, “PRAISES,” composed for the Tacoma Concert Band and Tacoma Ballet and Dance Ensemble in Washington State in 2000. This 25-minute, six-movement work was last performed at Lee by the Lee Wind Ensemble in 2001. During the concert, there will be a short presentation to honor members who will graduate in December, or those who will not be able to be involved in the Wind Ensemble next semester due to other obligations. Under Dr. Holsinger’s direction, the Wind Ensemble is committed to the highest level of performance of instrumental ensemble literature for winds and percussion. It is a non-traveling group that performs for special concerts on Lee’s campus. According to Dr. Holsinger, the personnel of this tightly-auditioned ensemble contains not only music majors, but also a variety of majors from across campus including accounting, math and science, and nursing. Since the ensemble’s founding 18 years ago, it continues to represent a cross-section of the best instrumental musicians on campus. For those unable to attend, the concert will be available to live stream at https://livestream.com/leeu. For further interest in the remainder of the ensemble’s season, its concerts will take place on Tuesday evenings Feb. 20, and April 17, 2018. For more information, contact the Lee University School of Music at 614-8240 or music@leeuniveristy.edu.